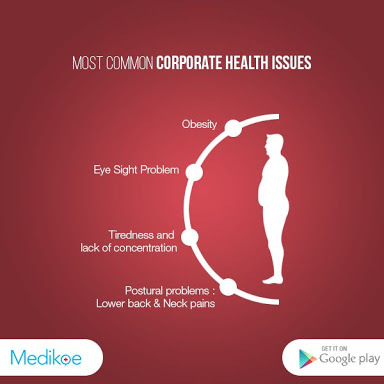 Core Strength Exercises To Avoid Occupational Hazards on Body at Corporate Houses. This is a variation of the regular crunch exercise. Here are the muscles that bicycle crunch targets. Target Muscles – Upper, mid, and lower abs, obliques, quads, hamstrings, calves, lats, and shoulders. Lie flat on the floor, and place your arms by your side. Place your hands behind your head. Raise your head and right knee. Touch your left elbow to your right knee and straighten your left leg. Touch your right elbow to the left knee and extend your right leg. The vertical leg crunch is challenging and super fun. Here are the muscles that it targets. Target Muscles – Upper, mid, and lower abs, obliques, quads, hamstrings, rhomboids, lats, and deltoids. Lie flat on the floor, and keep your arms by your side. Lift both your legs at 90 degrees from the floor. Lift your hands off the floor and try to touch your toes with your fingertips. Inhale and go back down.Exhale and try to touch your toes with your fingertips. The V-sit is a slightly advanced core strengthening exercise. However, if you practice it regularly, you can do it with ease. Here are the muscles that it targets. Target Muscles – Abs, glutes, obliques, quads, shoulders, quads, and hamstrings. Sit on a mat, extend your legs and lift them. Lean back a little and keep your hands extended and pointing in the front, and palms facing the floor. The side plank is a variation of the elbow plank. Here are the muscles that it works on. Target Muscles – Abs, glutes, quads, shoulders, obliques, hamstrings, and biceps. Lie on your left side. Keep your right leg directly over the left leg and left arm outstretched above your head. Place the left palm flat on the floor.Raise your body, keep your left palm directly below your left shoulder and form a straight line from head to heels. Use your abs and gluteal muscles to hold the position for at least 30 seconds. The plank rotation is an advanced version of the plank and side plank. And it targets all the muscles that are counted in core muscles. Target Muscles – Abs, glutes, chest, shoulders, obliques, deltoids, lower back, adductors, abductors, calves, quads, and hamstrings. Assume the push-up or hand plank position. Engage your core, and without bending your knees, lift your right hand off the floor. Twist your body and your right hand to your right, and keep your gaze on the right palm. Come back to the original position.Do the same on your left side as well. It doesn’t even feel like an exercise. Here are the muscles it targets. Target Muscles – Chest, abs, lower back, upper back, glutes, quads, and hamstrings. Lie on your back with the knees bent, feet flat on the floor, arms by your side, and palms facing down. Bring your heels as close to your buttocks as you can.Without lifting your feet, thrust your hips toward the ceiling. Keep your shoulders relaxed and your head and neck strain free. Hold the position for a minute and then go back to the starting position, lowering your hips slowly. The plank is one of the best core strengthening exercises. And that’s because it works on most of the core muscles. Here are the muscles you can activate by doing planks. Target Muscles – Abs, glutes, quads, shoulders, hamstrings, and biceps. Get into a push-up position with the elbows flexed, forearms and toes on the floor, and your body in a straight line from the head to the heels. Make sure to keep your elbows right below your shoulders. Engage your abs and squeeze your glutes to prevent any sagging in your middle. Look down at the floor. Avoid any strain on your head and neck.Hold for 30-60 seconds. Stretching your calves is a great way to loosen up your lower body before and during travel, and help prevent clots from forming. This ankle stretch simultaneously strengthens your shin muscles. Stand with your feet hip-width apart. You can use something to balance. Raise up onto the toes of your feet. Wall squats (also called wall sits) are the perfect exercise to strengthen your upper legs. Stand with your back against a wall, placing your feet about two feet out in front of you. Feet should be hip-distance apart.Bending your knees, slide your back down the wall until your knees are at 90 degree angles. Your knee joints should be over your ankle joints, so you may need to inch your feet further from the wall to create proper alignment. Your thighs should remain parallel.Hold for 30 to 60 seconds, and then stand up. Repeat for a total of three reps.